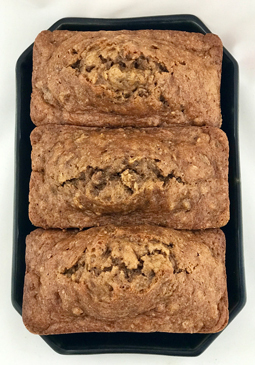 Morning Glory Banana Nut Bread - A recipe from Savor California, the online showcase for extraordinary gourmet foods and beverages from California. Blend flour, salt, baking soda and baking powder. In a separate bowl, beat butter and sugar on high for 2-3 minutes. Stir flour mixture into butter mixture until blended. Combine mashed banana and Morning Glory Granola. Fold into batter. Pour into a 6-cup loaf pan.